The effect of manganese and iron on the structure of AK12 silumin is studied by microscopic x-ray diffraction and spectrum analyses. Experimental alloys with Fe : Mn = 1 : 0, 1 : 0.5, 1 : 0.7 and 1 : 1 are investigated. Quantitative analysis of the microstructure is performed. The hub zone is studied for two models of car wheels. 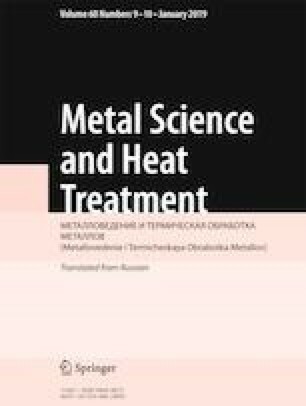 Recommendations for alloying AK12 silumin with manganese and iron for raising its mechanical characteristics are given. Translated from Metallovedenie i Termicheskaya Obrabotka Metallov, No. 9, pp. 3 – 7, September, 2018.